How interesting it would be to look down on your family and friends after you had died, and be able to not only see them, but hear what they are thinking. Especially, if you weren’t telling exactly how you had died. Such is the case with Molly Marx. Blond, petite, mother of a toddler, wife of a surgeon who specializes in refining noses, or butts, she was found in the thicket one day by a jogger in Manhattan. How she came to be there, and who her family and friends truly are, is the subject of this well written novel. We are able to view through Molly’s eyes, while she looks down from Duration, what people she loves are doing and thinking. At the same time, we flash back to episodes when she was still alive and interacting with them. We come to know Barry, her self-assured, philandering husband; Kitty, her superficial, materialistic mother-in-law; Lucy, her not as feminine sister; and lovely Annabel, her beautiful and treasured three year old daughter. Who is the culprit, we wonder, the cause of her demise? Could it be her husband? Or, is it Luke from whom she has taken guilty solace? Or, perhaps it is one of the women in Molly’s life with her own agenda. We aren’t sure until the end of the novel, when Molly makes peace from above with those below. I enjoyed this book for its artful look into a woman’s heart, the intricacies of marriage and friendships, the love we carry for our parents and children. I was drawn into the mystery, unable to guess how Molly had died. I breathed a sigh of relief at the closure of it all: Molly, lamented and loved. At least by most. Love the cover! The premise reminds me a little bit of The Lovely Bones, but it sounds like a good read. Sounds like a wonderful book, I like how you write-up the books without revealing too much, but still give an excellent glimpse of what you'll find….it's a gift you have and as JoAnn said the cover is fantastic! this sounds like a great read…..am adding it to my list! JoAnn, it reminds me a bit of The Lovely Bones, too, and also pieces of The Nanny Diaries because those mothers in Manhatten are insane! 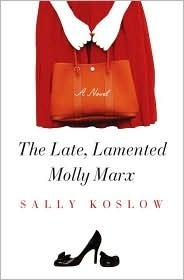 But, it truly stands alone as its own work: a mystery and examination into Molly's life. I liked it much better than The Lovely Bones which was really, really depressing to me.Shonda, I feel like I know Molly, too. Isn't that a gift that Sally, the author, gives us? I'm looking forward to reading your review when you finish.Lorraine, thanks. It's tricky to write about a book because you want to analyze all aspects and you just can't spoil it for people! I'm hoping I lay out the temptation to pick it up though.Sally, I'm so glad you found me and offered me the chance to review your wonderful book. Sometimes I find one that strikes me not at all, and I get so worried about hurting the author's feelings. However, this was hardly the case withi Molly. What a riveting read you wrote, immediately plunging us into not only the details but her heart. I also should have said how much I enjoyed your wit. You're writing is quite gripping.Sara, it's so good. You won't be disappointed. Plus, I'd like to talk about it with you from our Christian perspective. This sounds really good! I can see how it is like The Lovely Bones in premise. I liked that book, but I LOVED The Mercy of Thin Air (though also admittedly depressing- hard for these books not to be, I suppose). I will have to put this one on my list. Thanks for a great review!Also, your Rosie Riveter post is up this week, just so you know. Will probably put it up tomorrow or Friday. Aarti, I've not heard of The Mercy of Thin Air. I'll have to look into that upon your recommendation. Thanks for hosting Rosie: such fun to read about heroines! I must agree with the others here … this does sound like a very good read. Nice review!